Ce doped yttrium aluminum garnet (Ce:YAG) is an important photonic material that is used as a yellow phosphor for white light emitting diodes. In this work, the physical and optical properties of Ce:YAG nanophosphors are investigated and the effects of high-temperature thermal treatments and annealing atmospheres on the particle size and luminescence intensity are discussed. Furthermore, photo-luminescence (PL) was measured as a function of temperature and compared with PL from Ce:YAG single crystals and transparent ceramics to understand the mechanism of luminescence decay with temperature. While the characteristics of PL emission as a function of temperature for single crystals and NPs are similar and follow common decay trends, Ce:YAG transparent ceramics exhibit an interesting unusual increase in PL with temperature. We explained this unique novel behavior by a 4-step mechanism involving localized states in the band gap, and provided evidence from thermo-luminescence measurements to support this interpretation. The work reveals a new luminescence phenomenon arising from the overlap of PL and TL emissions; this phenomenon is most likely characteristic of transparent ceramics. W. Chewpraditkul, L. Swiderski, M. Moszynski, T. Szczesniak, A. Syntfeld-Kazuch, C. Wanarak, and P. Limsuwan, “Comparative studies of Lu3Al5O12: Ce and Y3Al5O12: Ce scintillators for gamma‐ray detection,” Phys. Status Solidi., A Appl. Mater. Sci. 206(11), 2599–2605 (2009). C. R. Varney, S. M. Reda, D. T. Mackay, M. C. Rowe, and F. A. Selim, “Strong visible and near infrared luminescence in undoped YAG single crystals,” AIP Adv. 1(4), 042170 (2011). J. Dong, A. Shirakawa, K. Ueda, H. Yagi, T. Yanagitani, and A. A. Kaminskii, “Efficient Yb3: Y3Al5O12 ceramic microchip lasers,” Appl. Phys. Lett. 89(9), 091114 (2006). J. Huie, R. Gentilman and T. Stefanik, “Domestically produced ceramic YAG laser gain material for high power SSLs,” Proc. SPIE 6552, 65520B (2007). A. Ikesue, T. Kinoshita, K. Kamata, and K. Yoshida, “Fabrication and optical properties of high‐Performance polycrystalline Nd: YAG ceramics for solid‐State lasers,” J. Am. Ceram. Soc. 78(4), 1033–1040 (1995). E. Pawlowski, M. Kluge, Y. Menke, U. Peuchert, A. Engel, Y. L. Aung, A. Ikesue, K. Beil, R. Peters, H. Keuhn, K. Petermann, and P. Heist, “Yb: YAG composite ceramic laser,” Proc. SPIE 7578, 1–8 (2010). A. Sennaroglu, C. R. Pollock, H. Nathel, J. 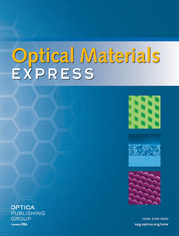 Mass, J. Burlich, S. Margraf, and R. Dieckmann, “New Cr4 laser materials for the near infrared,” Proceedings of SPIE, (SPIE. Digital Library) 2216, 110–122 (1994). X. Chen, H. Qin, X. Wang, C. Yang, J. Jiang, and H. Jiang, “Sintering and characterization of Gd3Al3Ga2O12/ Y3Al5O12 layered composite scintillation ceramic,” J. Eur. Ceram. Soc. 36(10), 2587–2591 (2016). E. Mihokova, M. Nikla, J. A. Mares, A. Beitlerova, A. Vedda, K. Nejezchleb, K. Blazek, and C. D’Ambrosio, “Luminescence and scintillation properties of YAG: Ce single crystal and optical ceramics,” J. Lumin. 126(1), 77–80 (2007). S. Chung, S. Chen, K. Wang, and C. Siao, “Promotion of solid-state lighting for ZnCdSe quantum dot modified-YAG-based white light-emitting diodes,” RSC Advances 6(57), 51989–51996 (2016). N. Narendran, Y. Gu, J. Freyssinier, H. Yu, and L. Deng, “Solid-state lighting: Failure analysis of white LEDs,” J. Cryst. Growth 268(3-4), 449–456 (2004). P. Yadav, C. Joshi, and S. Moharil, “Combustion synthesis of multicomponent ceramic phosphors for solid state lighting,” Int. J. Self-Propag. High-Temp. Synth. 21(1), 32–37 (2012). J. Cheng, K. Qi, Q. Wang, and J. Wan, “Kind of electrovacuo glass in a YAG display tube,” Proceedings of SPIE, (SPIE. Digital Library) 3560, 227–232 (1998). K. Ohno and T. Abe, “Bright green phosphor, Y3Al5−xGaxO12: Tb, for projection CRT,” J. Electrochem. Soc. 134(8), 2072–2076 (1987). T. Yanagida, H. Takahashi, T. Ito, D. Kasama, T. Enoto, M. Sato, S. Hirakuri, M. Kokubun, K. Makishima, T. Yanagitani, H. Yagi, T. Shigeta, and T. Ito, “Evaluation of Properties of YAG (Ce) Ceramic Scintillators,” IEEE Trans. Nucl. Sci. 52(5), 1836–1841 (2005). S. Chen, H. Wei, C. L. Melcher, and Y. Wu, “Spectroscopic properties of transparent Y3Al5O12: Eu ceramics,” Opt. Mater. Express 3(12), 2022–2027 (2013). M. Gong, X. Liang, Y. Wang, H. Xu, L. Zhang, and W. Xiang, “Novel synthesis and optical characterization of phosphor-converted WLED employing Ce: YAG-doped glass,” J. Alloys Compd. 664, 125–132 (2016). D. S. Kong, M. J. Kim, H. J. Song, I. S. Cho, S. Jeong, H. Shin, S. Lee, and H. S. Jung, “Fine tuning of emission property of white light-emitting diodes by quantum-dot-coating on YAG: Ce nanophosphors,” Appl. Surf. Sci. 379, 467–473 (2016). Z. Lin, H. Lin, J. Xu, F. Huang, H. Chen, B. Wang, and Y. Wang, “Highly thermal-stable warm w-LED based on Ce: YAG PiG stacked with a red phosphor layer,” J. Alloys Compd. 649, 661–665 (2015). G. Liu, Z. Zhou, Y. Shi, Q. Liu, J. Wan, and Y. Pan, “Ce: YAG transparent ceramics for applications of high power LEDs: Thickness effects and high temperature performance,” Mater. Lett. 139, 480–482 (2015). L. Guerbous and A. Boukerika, “Nanomaterial host bands effect on the photoluminescence properties of Ce-doped YAG nanophosphor synthesized by sol-gel method,” J. Nanomater. 2015, 1–10 (2015). X. He, X. Liu, R. Li, B. Yang, K. Yu, M. Zeng, and R. Yu, “Effects of local structure of Ce(3+) ions on luminescent properties of Y3Al5O12:Ce nanoparticles,” Sci. Rep. 6, 22238 (2016). K. J. Rajan and S. V. Manorama, “Formation of hierarchical macro porous YAlO: Ce multifunctional nanophosphors,” J. Appl. Phys. 119(11), 114902 (2016). Y. Cho, Y. Huh, C. R. Park, and Y. R. Do, “Preparation with laser ablation and photoluminescence of Y3Al5O12: Ce nanophosphors,” Electron. Mater. Lett. 10(2), 461–465 (2014). J. L. Wu, G. Gundiah, and A. Cheetham, “Structure–property correlations in Ce-doped garnet phosphors for use in solid state lighting,” Chem. Phys. Lett. 441(4-6), 250–254 (2007). D. A. Steigerwald, J. C. Bhat, D. Collins, R. M. Fletcher, M. O. Holcomb, M. J. Ludowise, P. S. Martin, and S. L. Rudaz, “Illumination with solid state lighting technology,” IEEE J. Sel. Top. Quantum Electron. 8(2), 310–320 (2002). E. Zych, C. Brecher, and H. Lingertat, “Scintillation properties of YAG: Ce optical ceramics,” Mater. Sci. Forum 239-241, 257–260 (1997). J. McKittrick, L. Shea, C. Bacalski, and E. Bosze, “The influence of processing parameters on luminescent oxides produced by combustion synthesis,” Displays 19(4), 169–172 (1999). B. Sundarakannan and M. Kottaisamy, “Sol–gel derived flux assisted synthesis of fine particles YAG: Ce3+ phosphor for remote phosphor converted white light emitting diodes,” Mater. Res. Bull. 74, 485–490 (2016). L. Wang, F. Zhao, M. Zhang, T. Hou, Z. Li, and H. Huang, “Preparation and photoluminescence properties of YAG: Ce3+ phosphors by a series of amines assisted co-precipitation method,” J. Alloys Compd. 661, 148–154 (2016). T. Ogi, A. B. D. Nandiyanto, W. Wang, F. Iskandar, and K. Okuyama, “Direct synthesis of spherical YAG: Ce phosphor from precursor solution containing polymer and urea,” Chem. Eng. J. 210, 461–466 (2012). F. A. Selim, A. Khamehchi, D. J. Winarski, and S. Agarwal, “Synthesis and characterization of Ce:YAG nano-phosphors and ceramics,” Opt. Mater. Express 6(12), 3704–3715 (2016). C. Yang, G. Gu, X. Zhao, X. Liang, and W. Xiang, “The growth and luminescence properties of Y3Al5O12: Ce3+ single crystal by doping Gd3+ for W-LEDs,” Mater. Lett. 170, 58–61 (2016). J. Ji, L. A. Boatner, and F. A. Selim, “Donor characterization in ZnO by thermally stimulated luminescence,” Appl. Phys. Lett. 105(4), 041102 (2014). D. J. Winarski, C. Persson, and F. A. Selim, “Hydrogen in insulating Y3Al5O12 strongly narrows the energy gap,” Appl. Phys. Lett. 105(22), 221110 (2014). S. M. Reda, C. Varney, and F. A. Selim, “Radio-luminescence and absence of trapping defects in Nd-doped YAG single crystals,” Results Phys. 2, 123–126 (2012). C. H. Lu, H. C. Hong, and R. Jagannathan, “Sol–gel synthesis and photo luminescent properties of cerium-ion doped yttrium aluminum garnet powders,” J. Mater. Chem. 12(8), 2525–2530 (2002). P. Husband, I. Bartošová, V. Slugeň, and F. A. Selim, “Positron annihilation in transparent ceramics,” J. Phys. Conf. Ser. 674, 012013 (2016). S. Arjoca, E. G. Víllora, D. Inomata, K. Aoki, Y. Sugahara, and K. Shimamura, “Temperature dependence of Ce: YAG single-crystal phosphors for high-brightness white LEDs/LDs,” Mater. Res. Express 2(5), 055503 (2015). E. Zycha and C. Brecher, “Temperature dependence of Ce-emission kinetics in YAG: Ce optical ceramic,” J. Alloys Compd. 300-301, 495–499 (2000). V. Bachmann, C. Ronda, and A. Meijerink, “‘Temperature Quenching of Yellow Ce3+ Luminescence in YAG: Ce,” Chem. Mater. 21(10), 2077–2084 (2009). D. J. Robbins, “The Effects of Crystal Field and Temperature on the Photoluminescence Excitation Efficiency of Cd + in YAG,” J. Electrochem. Soc. 126(1550), 9 (1979). D. T. Mackay, C. R. Varney, J. Buscher, and F. A. Selim, “Study of exciton dynamics in garnets by low temperature Thermo-luminescence,” J. Appl. Phys. 112(2), 023522 (2012). C.R. Varney, D.T. Mackay, A. Pratt, S.M. Reda, and F.A. Selim, ‘Energy levels of exciton traps in YAG single crystals,” J. Appl. Phys. 111, 063505 (2012). F. A. Selim, C. R. Varney, M. C. Tarun, M. C. Rowe, G. S. Collins, and M. D. McCluskey, “Positron lifetime measurements of hydrogen passivation of cation vacancies in yttrium aluminum oxide garnets,” Phys. Rev. B 88(17), 174102 (2013). Fig. 1 XRD patterns of Ce: YAG nanophosphors annealed in various temperatures from 1000 to 1500°C. All YAG orientations are labelled on the graph. Fig. 2 Grain size of Ce: YAG nanophosphors annealed at various temperatures from 1000 to 1500°C. Fig. 3 PL intensity of Ce: YAG nanophosphors as a function of wavelength: (a) for different annealing temperatures, (b) for different annealing atmospheres. Fig. 4 PL emission intensity as a function of wavelength. The graph compares the emission of Ce: YAG NPs with single crystals and transparent ceramics. Fig. 5 a) Temperature dependent PL emission measurement of NP as a function of wavelength over temperature range of 83K-623K. b) PL emission intensity of NP at T = 623K. c) Integrated PL peak intensity as a function of temperature for NP. It shows that the luminescence intensity sharply decays with rising temperature up to 200 K where it undergoes a little increase, then decays again. Fig. 6 a) Temperature dependent PL measurements of Ce: YAG single crystal. b) Integrated PL intensity of Ce:YAG single crystal as a function of temperature. Fig. 7 a) Temperature dependent PL emission spectra of Ce: YAG transparent ceramics as a function of wavelength over a temperature range of 83 to 633 K. b) Integrated PL peak intensity of Ce: YAG transparent ceramics as a function of temperature. Fig. 8 a) Thermo-luminescence contour plot of Ce: YAG transparent ceramics as function of temperature and wavelength. Excitation was carried out using sub-band gap light of 456 nm (2.72 eV). b) Glow curve of TL emission of Ce: YAG transparent ceramics. Fig. 9 Diagram illustrating the mechanism behind TL emission and its contribution to PL spectrum. a) Excitation of electron from defect center to the conduction band by 456 nm light, b) trapping of electron by another defect center, c) thermal stimulation, d) recombination of charge carriers and light emission.